Turns out it was childhood memories of cheesesteaks combined with feeding firemen in the testing times immediately following Katrina. Nostalgia and altruism have combined nicely to create a casual, quirky (but not in a cynical way) BBQ joint that squats uptown among the high falutin’ folk with nary a concern. It serves meat. Great smoked meat. Growing up in the UK, where barbecues are a thing to fear and no-one has dominion over, I don’t have my go-to meat. Paralysed by indecision, I went for the sampler (“All the meats, all the sides”) and never looked back. Go carnivore or go home. Actually, don’t go home, because you can stay for some dank (as the kids say, maybe) coleslaw and macaroni. And molasses-stewed collards. OH MY. But the meat. It’s tender, seemingly simple (though what wizardry is going on backstage, who knows?) and basks in the glow of a dozen condiments, each better than the next though South Carolina (a rosemary and mustard sauce), you get my heart. Ok, my belly. Sausage, brisket, chicken and two grown men straining to finish, but only because of gastric confines. You’re damn right I had it for breakfast the next day. In fact, that should be a new criteria for good restaurants – would you eat the leftovers for breakfast? I would. I did. McClures is good value, family-friendly, chirpily designed with some weird NOLA art on the walls and no-nonsense. Which is what you want. No, really, it is. Believe me. 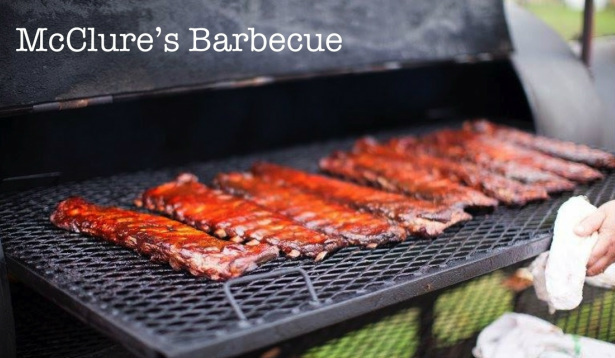 What you're eating: Barbecue, and lots of it. And all the sauces.